Microsoft’s(s msft) newest gaming add-on, the Kinect, isn’t just setting sales records; it’s poised to usher in a completely new way for people to interact with various machines. This potential is already being recognized in video games that allow complete control through actual full-body movement. Navigating through menus with hand gestures and voice commands are part of Kinect too, which surpassed 10 million units sold by March, just four months after the device debut. But Kinect’s success is only just beginning. Today, Microsoft introduced an official software development kit that can bring new uses to the Kinect, limited only by what third-party developers envision. 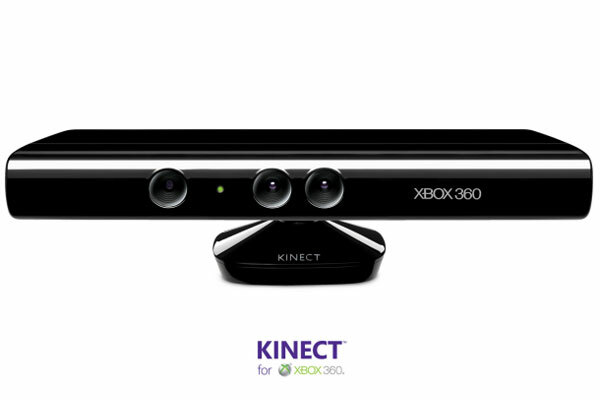 Even without the SDK, Microsoft’s Kinect is successful and forward thinking in its own right. When paired with the company’s Xbox 360 console, Kinect gets gamers off the couch and actually “into” the game. How so? The $150 gadget combines infrared sensors, a color camera, four microphones and its own tilting mechanism to see and hear game players in detail. This data is sent to the game console over a standard USB port where software interprets players actions in real-time and is used to control the on-screen game. Our first look video shows how this works in a two-player obstacle course game. As fun (and as exhausting) as game play is with the Kinect, the technologies it provides for a relatively low cost, combined with the standard USB port, are what could make Kinect even more successful. Not long after the device debut last November, hackers and enthusiasts realized Microsoft wasn’t encrypting the Kinect’s data; users could access the information by connecting a computer to the device. That led to some amazing 3-D imagery from two Kinect units, homebrewed holographic television from M.I.T., and even an inexpensive robot kit that pairs Kinect with a netbook and basic Roomba device. Raw sensor streams. Developers can see and use the raw data from Kinect’s depth sensor, color camera sensor, and microphone array. This means apps can “see” and “hear,” perhaps leading to interpretation applications for the hearing or vision-impaired. Skeletal tracking. Images of one or two people at a time are supported and can be used for new gesture-based user interfaces or virtual wardrobe applications, for example. Advanced audio capabilities. Kinect’s SDK can take advantage of both advanced noise cancellation and the Windows speech recognition engine. Natural language commands and queries for computers, appliances or web-connected devices could arise. One sample game included with the Kinect SDK illustrates a simple game that leverages the skeletal tracking and voice recognition features.Up to two players interact with falling geometric shapes such as stars and triangles. Shouting out a color changes the color of the shapes on the screen. More impressive to me were some of the Code Camp efforts that third-party developers created in under 24 hours with the new Kinect SDK. Earlier Thursday, Microsoft live-streamed some of these and I saw a flying toy helicopter controlled via Kinect. Raising one’s hands caused the helicopter to rise, while turning one’s body controlled left and right movement. 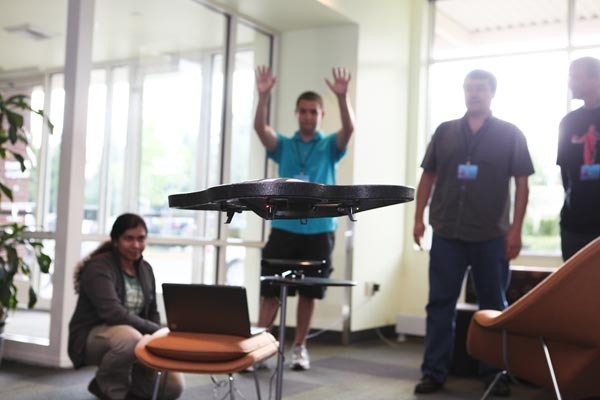 But toy flying machines are simply an example of Kinect’s potential. The “killer app” of Kinect isn’t one specific application; it’s the potential for a limitless amount of applications that bridge the physical world with the computing world. Think beyond the decades-old mouse and keyboard model for input. Consider not just video games, but interactive video movies that allow you to be part of the show. And perhaps Kinect-powered applications can power not just robots, but sensory input and interaction for those that aren’t physically able to use computing devices. Without a doubt, the Kinect hardware is a runaway hit, selling faster than even Apple’s iPad 2 (s aapl). But like the iPad, it’s the software that could revolutionize the way people think of and interact with the world of computers. Thanks to early efforts by the hacker community, Microsoft has recognized the potential of its amazing new device and unlocked the doors to a world of new applications that can help merge physicality with computing. And the company has made it easy too: Just minutes after downloading the SDK and plugging my Kinect into a computer, I’ve been “Kinnectified”! ‘Kinected’ sounds more cool that ‘kinnectified’…dont you think :-)?? Just imagine if they took the same approach as Sony to hacking. Things would be a lot different with Kinect right now, I think. And actually they did want to do that in the beginning when the hackers open sourced a Kinect driver, but they quickly realized that all the publicity from these hacks is good for the Kinect brand and for their sales. Samsung has also gotten a lot of attention lately when they gave some Galaxy S2 to the CyanogenMod team. I think the lesson here for tech companies is to embrace the hacking community, not fight against it.